Advocate. Broker. Convener. Educator. Researcher. The Debate Continues: Are Grades or Admissions Tests Better Predictors of College Success? 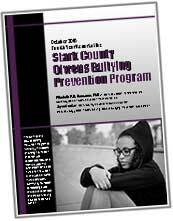 An evaluation addressing two main questions: Has the OBPP helped to reduce reported incidents of bullying behavior in Stark County OBPP schools in year three implementation? Has the OBPP been implemented with fidelity in cohorts 2-4?